Filip Jerolimov at Cape4 Yachting tells me he's closed on his listing for sale, the 31 metre motor yacht Ziacanaia, to a direct client. Built by Italian superyacht yard Ferretti, she was designed by the well known naval yacht architect Giovanni Zuccon as one of the yard’s Navetta range and delivered in 2003 as a personal yacht for Norberto Ferretti himself. An eye-catching dark blue hull colour is matched by a welcoming interior in warm wood colours and fabrics. Accommodation is for eight guests in four staterooms. The master suite is on the main deck and below there is a VIP stateroom plus a double and a twin cabin. All staterooms have en suite bathroom facilities. Ziacanaia matches classic and timeless design with modern shipbuilding techniques and materials. Up on the sun deck, Ziacanaia hosts a Jacuzzi, barbecue, bar, ice maker and sun beds, perfect for al fresco entertaining and dining. 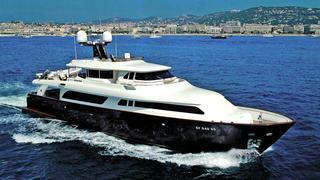 Twin 1,300hp MAN engines give her a cruising speed of 12 knots. Ziacanaia was asking €2.39 million and will retain her name.